China. One of the most interesting places to visit on this planet. Not just because of its many historical sights, cultural differences and dedicating service. No, also because of the many new hotels popping up each year. From lifestyle brands, design hotels to the ultimate luxury hotels, China is seeing all kinds of hotel openings. One of these top notch places that just opened a few years ago is the Waldorf Astoria in the real heart of Beijing. Situated on the most perfect spot in town, just 10 minutes on foot from the Forbidden City, meters from the main pedestrian area of Beijing and next to all upscale shops. It would be a lie to say there is any better location than that. When we flew in from Seoul, we grabbed a cab and called the hotel so that they can tell the address to the driver in Mandarin. This went extremely well and so we went from the airport all the way to the hotel for as low as 15 USD one way. There are also limousines available for 200 USD one way but we preferred to have the typical Beijing experience and went for the full adventure including not understanding what they were saying and driving through narrow roads while taking extreme short cuts, in order to avoid traffic queues. Once we arrived at a golden building, indicating Waldorf Astoria, we knew we survived the cab ride (well it was not terrible at all, just like in any other Asian city). Upon leaving the car, there was already an array of staff waiting for us to welcome us, help us with the luggage, open the door and showing us the way to the reception. Well, there was really one staff member for each of the activities mentioned (Welcome to China where hospitality is still celebrated). We arrived at the wonderful, yet discreet front desk and were checked-in efficiently and fast by a friendly lady before we were welcomed by the wonderful Jeremy (the PR Director of the hotel). Then we were introduced to Natalie, one of the Personal Concierges of the hotel. She accompanied us to the room and gave us a brief tour of the property on the way up. She opened the door and we were speechless of how spacious our Premier Double Room was. There was a huge entree with lots of storage space, a wardrobe with the fluffiest slippers I have seen for a long time plus a luggage rack. To the right there was the main area of the room, including two extremely comfortable double beds with 4 pillows each, enough space on the nightstands, a television opposite the beds, another television in the semi-separate living area with a sofa and a comfy armchair in addition to a small working corner with a vast working table, a huge minibar and again lots of storage space. I loved the Nespresso coffee machine, along with the welcome amenities consisting of salty and sweet snacks. Being an asian city, it is recommended not drinking the tab water in Beijing, therefore the Waldorf Astoria provided plenty of still water throughout the room. It is just amazing when you don't have to call for water every night as you are running out of it - it's not that expensive to provide more water than the minimum, isn't it. Beside the spacious bed-/living room, I found the bathroom to be super nice with lots of marble and elegant, perfectly fitting golden finishings. While I did not have time to take a bath, I appreciated the television in the bathroom. At least I could listen to music when showering which is always a great add-on. Unfortunately they only provided one set of toiletries, which are by Salvatore Ferragamo as usual at the Waldorf Astoria, however refilled it during evening service, so absolutely fine! All the desired amenities have been provided in the room, including shaving & dental kits, bath salts and fluffy bathrobes. After we have briefly inspected the flawless room, we had lunch at the magnificent Chinese restaurant on the third floor. I have to mention, the food was indeed truly outstanding on all aspects. I thought of the service to be the most impressive (being it our first day in China), however it turned out that the food was so good, I simply loved it! While we had ordered red prawns as a starter, we decided to go for the fried rice with lobster and foie gras, which both turned out to be amazing choices. I can't stop thinking of this gorgeous fried rice - wow it was simply delicious. 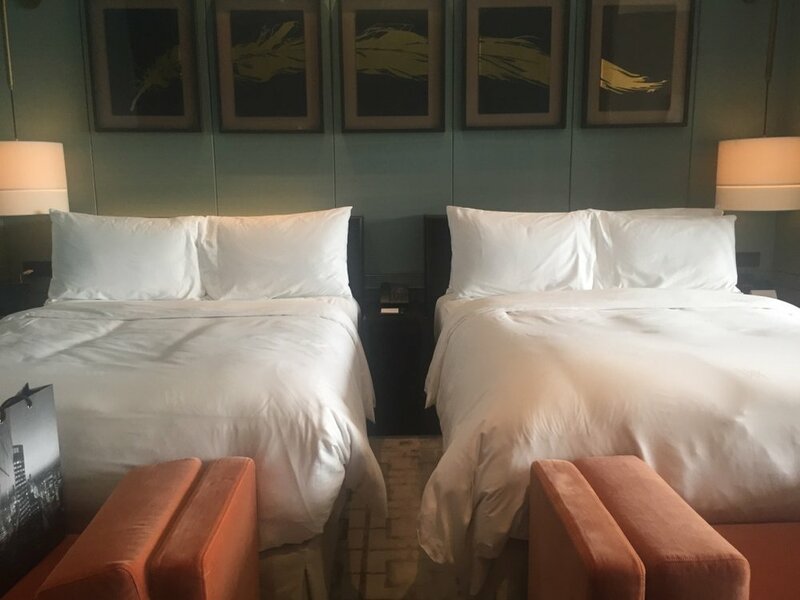 Don't forget to take a look onto the interior design and the plates which were especially created for the restaurant, a truly wonderful introduction to our stay in Beijing. Following lunch, we had a visit at the tailor, arranged and organised by the lovely Natalie (it felt like having our personal manager) where we ordered three tailor made suits. Without any hassles and communication problems, we found the recommendation of Natalie to be the simply perfect address for our tailor made suits. Within two days the suits were ready and brought to our hotel (following a fitting after the first day). We then had a look around the hotel and walked down the pedestrian street before we returned back and went to the spa area. Unfortunately I missed a warm feeling as it was relatively cold in the spa lobby. However the pool was wonderfully styled and had a perfect size plus the right temperature (it was warmer than a normal indoor pool and therefore on point). While we both missed lounge chairs (we had to sit in normal chairs which was not as comfortable), we found ourselves in the even warmer jacuzzi and relaxed for a few minutes until we fell asleep due to Jetlag and nearly missed our amazing dinner. Next to the pool is also a spacious changing area with sauna and steam bath as well as a fitness centre which I would consider to be on the smaller size compared to gyms at the other hotels we have stayed during our trip. A heavenly night after, we went down for breakfast and were warmly welcomed again. The buffet is styled like a walk-in kitchen which I found very interesting and the selection was vast with hot dishes from Asia as well as western dishes. Service was very nice and they refilled my orange juice properly, though brought me a normal coffee instead of a cappuccino. I really loved their eggs Benedict and my colleague's omelette looked tasty as well. In general the entire atmosphere was so upscale and elegant, it felt like sitting in the city's living room overlooking the hustle and bustle of the busy streets. During the day we have booked a private tour to the Forbidden City and the Great Wall. We were so lucky and had the best weather one could have with blue (!!) sky (so rare in Beijing due to air pollution) and such a comfortable temperature. Overall, our stay at the Waldorf Astoria was perfect for the purpose we had (which was to see the culture and the main sights of China's capital) and value for money was absolutely top. There may not be any other hotel with such a great service, this perfect design and that gorgeous location. Should you plan to go to Beijing for cultural reason, this is your place to stay. We were exclusively invited by the Waldorf Astoria Beijing for editorial purposes, however all above written expresses our own opinion.